Today gold price in Iceland is Rs.3,192 less than today gold price in India. Icelandic krona to India Rupee conversion rate: 1 = 0.5755 . 1 Icelandic krona (ISK) equals to 0.5755 Indian rupee (INR). 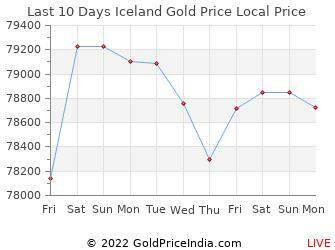 Today gold price in Iceland for 24 karat gold is 49,326.60 Icelandic krona per 10 grams. This calculator uses the current Gold price for Iceland only. Calculate Gold in Iceland in grams. Other prices for other countries, click here. Today gold price in Iceland for 22 karat gold is 45,212.40 per 10 grams. 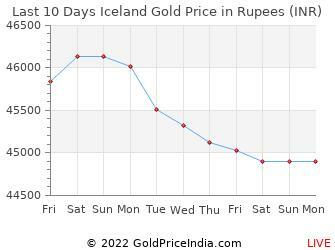 Iceland Gold Price Chart showing prices over the last 10 days in Icelandic krona. Today gold price in iceland in Indian Rupees for 24 karat gold is 28,387 Rupees per 10 grams. Today gold price in iceland in Indian Rupees for 22 karat gold is 26,020 Rupees per 10 grams. Today gold price in India for 24 karat gold is 31,579 Rupees per 10 grams. Today silver price in Iceland is 0.00 Icelandic krona per kilogram. Today gold price in India for 22 karat gold is 28,947 Rupees per 10 grams.